John Brown, the third son of Timothy/Thady Brown and Honora/Hannah Kelly, was baptized January 1, 1835 at Patrickswell Catholic Church in County Limerick, Ireland. Remember from an earlier post (Instant gratification!) that the second child of Timothy and Hannah, David, baptized January 11, 1832, has not been accounted for in America, and, it is presumed that he died before the family arrived in Boston in January 1849. (Arriving in America) John is enumerated in the 1850 US census in Brandon, Rutland County, Vermont with the rest of his family. He is shown as single and was a laborer at age sixteen. Like his older brother Patrick, John moved to central Ohio in the 1850s; unlike his brother, he did not leave the Columbus area. Church in Columbus, Ohio.1 Ellen is a sister of Ann, the wife of Patrick. 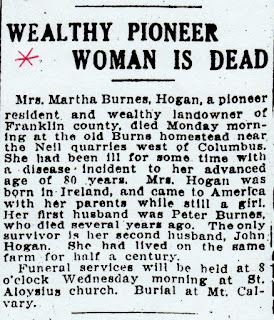 Another sister, Martha Burns, also lived in Columbus. Martha’s family and John and Ellen Brown lived and worked in close proximity; so close, that it is impossible to tell John’s story without also telling the story of Martha Burns and her husband, Peter. was Thompson.2 The 1908 death certificate for Martha, the last survivor of the three sisters, shows the father’s name as Michael Burnes and the mother’s name as, “Julia,” with no surname given.3 One son of John and Ellen, James, shows a surname of “Thompson” for his mother’s maiden name on his death certificate. 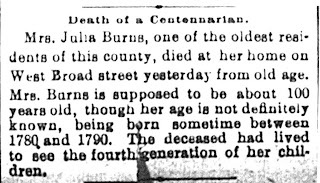 The surname is “Burns,” but, it could be a clue to the identity of this family since there does not seem to be a surname referenced in other records. for County Laois.4 Death certificates for most of the children of Anne and Ellen show their mother’s place of birth as “Ireland,” as do so many records for Irish families. One daughter of Anne, Mary Ann, shows the birthplace of her mother, Anne Burns Brown, as “Queenstown.”5 Queenstown is now known as the city of Cobh in County Cork where many immigrants left for the Americas; but, the city had recently been in the news because of the Irish Civil War (1922 to 1924). Perhaps the family of Mary Ann knew the location was “Queens-something” and picked up on the familiar name in the news. A daughter of Ellen, another Mary Ann, shows the birthplace of her mother, Ellen Burns Brown, as “County Limerick.”6 We do know that Limerick is the origin of the Brown family, but was the Burns family also from Limerick? 8 states that she was born sometime between 1780 and 1790. A review of the birth year of the three daughters (from census records), Anne (1830 to 1835), Martha (1829 to 1834), and Ellen (1842) indicate that Julia could have been born as early as 1790, but probably not before. Armed with this information, I attempted to find church records in Ireland using many surname variations of Burns/Byrnes and Thompson/Thomson. I also checked alternate first names and nicknames for the three girls, Anne, Martha, and Ellen.9 I did not find baptism records, nor did I find a marriage record for Michael and Julia. While I did not locate records, I believe Laois or one of the surrounding counties is the probable origin for the Burns family. Information on the tombstone is the earliest information available and likely came from Martha, Julia’s daughter who was also born in Ireland, presumably in close vicinity of her mother’s birthplace. Remember, that while some church records in Ireland began early, before 1800, other parishes did not begin until 1850 or even later. 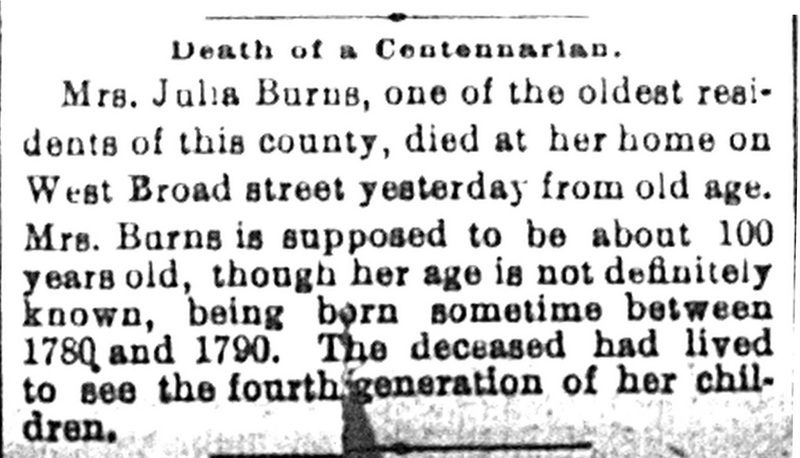 Martha Burns, daughter of Michael and Julia Burns, married Peter Burns, son of John and Esther Cary Burns,14 sometime before June 1851 when their oldest child, Julia, was born. 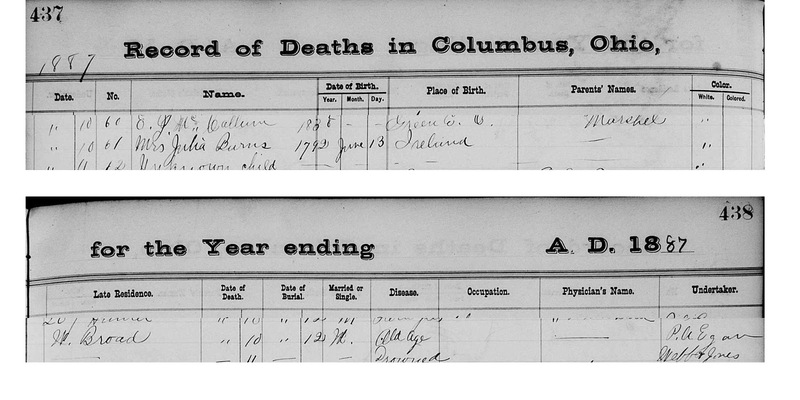 Both of their children, Julia and a younger brother, Willie (about 1853) were born in Ohio as shown in the 1860 U.S. Census.15 There does not appear to be a record of their marriage in Ohio despite a possible listing for Martha’s family in the 1850 U.S. Census in Columbiana County in central eastern, Ohio. (See a previous discussion in It looked like home! The Vermont church records do not begin early enough, but could Martha and Peter have met and been married in Vermont? published at her death in 1909.16 The news clipping (see right) states that she, “. . . came to America with her parents while still a girl.” From this, we know that the family of Michael and Julia Burns probably traveled together. Although all other records state that Martha was born in Ireland, the 1900 Census record states that she was born in Canada and came to the US in 1848.17 (see copy below) Could Martha and her family have emigrated first to Canada before coming to America? I have not found any evidence, and, this may be too much of a coincidence, but, could there be a Canadian tie in addition to a Vermont tie? Questions and yet more questions! The next post will give further information about John, third son of Timothy and Hannah Brown, in Franklin County, Ohio – and yes, probably more questions. 2. Brown, David, Kewanee, IL, 11 May 1943, Letter to Esther _________, Columbus, OH, Chart 2 and Chart 3. 4. Catholic Cemeteries, Julia Burns, 1887, grave 3, lot 85, Cathedral, section B, Mt. Calvary Cemetery, Columbus, Ohio. There is no record for Michael Burns, husband of Julia. Note that the tombstone shows the year of death as 1886. The death register and the news article are from 1887. 5. 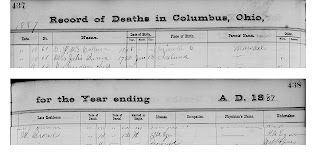 “Illinois Deaths and Stillbirths, 1916-1947,” database, Family search (https://familysearch.org/ark:/61903/1:1:NQ9Q-JHM : 27 December 2014), Mary Cox, 22 Mar 1930; Public Board of Health, Archives, Springfield; FHL microfilm 1,643,655. 9. I checked indexes at Find My Past (Findmypast.com), Irish Family History Foundation (rootsireland.ie), and IrishGenealogy.ie both with and without surnames and variations for all of Ireland paying particular attention to the counties of Limerick, Laois, and the counties surrounding Laois. I did locate one record showing the father as Michael Byrne and the mother as Judy Thompson, (Judith is an alternate name for Julia), in the parish of Killaveney in County Wicklow, but, I don't the other entries for the parish are the same couple. (See below) I also reviewed the microfilm for this parish available online through the National Library of Ireland (registers.nli.ie/parishes/) with no further results. 10. National Library Ireland, Carbury and Dunforth Catholic Church, Carbury, County Kildare, Ireland, microfilm 04203/10, Dublin, Ireland. Peter was baptized May 17, 1832; Edward was baptized March 16, 1827; John was baptized February 23, 1825. There is no baptismal record for Patrick born March 1821; however, baptismal records for this parish do not begin until October 1821. Patrick was likely born and baptized in the same location as his brothers. 11. Ancestry.com. Quebec, Canada, Vital and Church Records (Drouin Collection), 1621-1968. Available online at Ancestry.com. Patrick married Rose Coffey February 8, 1843. John married Margaret Kilmartin/Martin February 12, 1846. Edward married Mary Woods January 24, 1848. 12. The Vermont French-Canadian Genealogical Society, Baptism Repertoire St Mary “Our Lady of Good Help” Brandon, Vermont inluding the Old St. Monica, Forestdale, Vermont Mission, Vermont Catholic Diocese, 2014, Burlington, Vermont. Baptisms for St. Monica include the years 1856 to 1868. Baptisms for St. Mary include the years 1869 to 1948. 14. 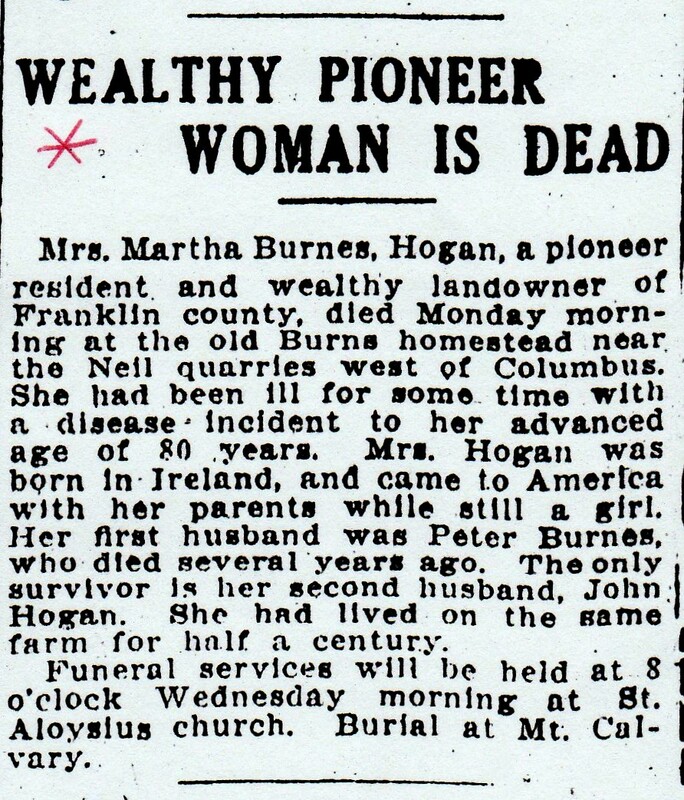 Information from Great Aunt Maggie, (Margaret Brown Shrum), and her sisters, fervently avowed there was no blood relation between Martha Burns and Peter Burns. I guess we should have asked more questions! 17. 1900 U.S. Federal Census, Franklin, Franklin, Ohio, Roll: 126; Page 7A; Enumeration District: 0030. James, listed as a son, is actually the son of Martha's second husband, Michael Hogan and his first wife.